Varieties. As a producer of seed for SPL, blight and virus resistant varieties are where my interests lie. 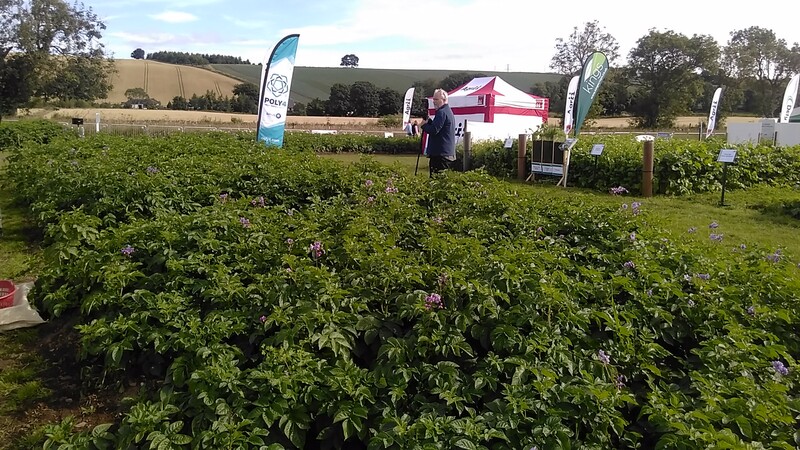 Skea Organics were there showcasing the Sarpo range (Mira, Axona, Kilfi Blue Danube, Shona, Una and Gwyn), as were Agrico/ Bioselect with their blight resistant offer (Carolus, Athlete, Aloutte and twinner), including a new one, ‘Twister’ – a white second early which looked pretty good, I have to say. Agronomy: Emerald Crop Science featured prominently, and I was very interested to learn about their OptiYield range – microbial mixtures applied as liquids/ sprays to soil or foliage to enhance microbial activity and therefore soil fertility and disease suppression. The principle is fine, but I’m not quite convinced of the economics of it in my situation. I can’t help feeling if I just manage my soils well, I’ll get to pretty much the same place eventually. However, I was encouraged to see biological approaches to fertility vying so successfully with mineral fertilisers. Blight: I spent a very instructive 20 minutes with David Cooke of JHI, who tracks the populations blight strains with something bordering on obsession. I was particularly interested to learn of the arrival in the UK of a new strain – 37_A2 – that was around in France, Netherlands and Belgium in 2015 and 2016, and cropped up in Kent this year. It’s causing some concern to conventional growers because it shows resistance to certain fungicides, but strains come and go all the time so how significant this strain will be remains to be seen. For breeders and growers of resistant varieties, it serves as reminder, if one were needed, of the astonishing variability and adaptability of this pathogen and the need to be constantly producing new material. The other bit of blight news is that since last year the ‘Smith Period’, used since the 1950’s to predict out breaks of blight, is being replaced by the ‘Hutton Criteria’. I won’t go into detail, but the key difference is that the critical period of Relative Humidity has been reduced from 11 down to 6 which, a profusion of multicoloured graphs convinced me, has improved the accuracy of outbreak predictions significantly. Apps: There are a growing number of apps for growers out there; I guess you’re fan or you’re not and I am. I was particularly taken by Agrivista’s new Potato Sizing app (http://potatosize.agrovista.co.uk). Basically, you dig a couple of meters in a row, lay out the tubers on the soil, take a photo and weigh them. Upload your pic into the app along with your sample weight and row/ plant spacing and it tells you what proportion are in what size bracket (which if you’re seed producer is vital information) and an estimate of yield. I haven’t quite thrown my sizing rings away, but they have been relegated to the bottom draw! The other app which caught my eye was ‘Buntata’ (downloadable from ‘Google Play’) which I discover is Gaelic for potato. It is an online database of pest and diseases, packed with clear, high quality images, accompanied by clear, quality information on biology and control. Fantastic, although I was kind of hoping that I could take a pic, feed it into app and it would tell what I’ve got, but I’ll just have to wait for that! Contacts: Of course, what you learn is only half the story – the other half is who you meet. As a new potato producer, I have grown to realise I am something of a novelty but I am bowled over by the good will of my more experienced colleagues. My business card collection has increased massively and along with it offers of help and support from some of the most knowledgeable people in the business. I’d like to thank the Sustainable Potatoes Wales project who covered my costs and Sarpo Potatoes Ltd for the giving me opportunity to go.